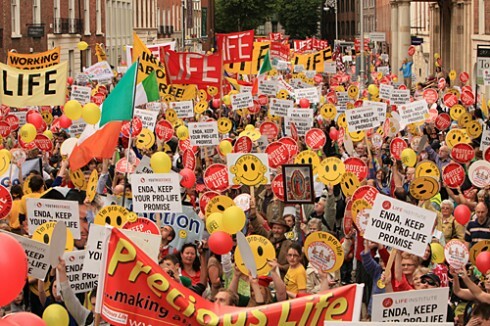 Dublin, Ireland, Jul 7, 2011 / 06:22 am (CNA).- Thousands of people attended a large pro-life rally in Dublin to oppose attempts to force abortion on Ireland by changing its laws. Speakers called on Irish prime minister Enda Kenny to keep his promise that his party would be opposed to the legalization of abortion, according to rally co-sponsor Youth Defence. The European Court of Human Rights in December ruled that Ireland’s abortion ban breached the rights of a woman who had to leave the country in order to procure an abortion. Fine Gael has set up an expert group to examine the judgment. The “rush” by Ireland’s Labour Party to call for abortion legislation after the ruling hurt their performance in the 2011 elections, Niamh Uí Bhriain of the Life Institute told the crowd. I really do think that we are winning the war on abortion. We have,however, miles to go before we win the other culture war battles. The Church is losing the battle to define marriage between one man and one woman. But all things are possible in Christ. And since the right to life is foundational, we have reason for our hope. This entry was posted in Culture Wars, Pro life and tagged Abortion, Ireland, Life issues. Bookmark the permalink.